Play with Your Friends ... Save Your Life! While I was a child grow­ing up in Grafton, North Dakota (a small town near the Canadian bor­der), my mother Leatrice frequently told my five siblings and me to, “Go outside and play with your friends.” She said it to shoo us out from underfoot and have some peace and quiet in the house, but it turns out to be the best advice EVER if your goal is to live a long, happy, healthy life. The single most important thing you can do for longevity and well-being is to cultivate close relationships with your family, friends, neighbors and co-workers; if you can get together regularly to play with them - well that’s the best. When Bill comes in to see me, he always has a sparkle in his eye and is speaking quickly, as if he is excited - usually because he is. This time he was enthused because he was planning on playing in another table tennis tourna­ment in a few days. When I asked him, “How long have you been playing ping pong, Bill?” He abruptly corrected me, “The formal name for the sport is table tennis.” He should know, he has been playing racquet sports for almost nine decades, and he’s more passion­ate than ever about playing with his many, many friends, most of whom he has met on the courts. Bill is 95 now, and is in remarkably good health. When you ask him his secret he says it’s racquet sports - ev­erything from tennis to badminton to squash to table tennis and pickleball. He’s also been coaching people in tennis and badminton since coming home from France after serving three years in the European theater of World War II. Brand new research validates Bill’s intuition that his love of racquet sports might be contributing to his exceptional longevity. Clearly, exercise is key if you would hope to be like Bill one day, who’s still having the time of his life as he closes in on the century mark. But the type of exercise you prefer seems to make a big difference. If your usual workout is a slog on a treadmill or elliptical trainer, it may not make you live much longer - though it may seem longer because for most people it’s such an unpleasant way to get exercise. When people complain to me that time flies by too quickly, I suggest they take up indoor stationary cardio exercise - 30 minutes can seem like an eternity. On the other hand, go play pickleball with your friends or shoot a round of golf with your pals and it won’t feel like work. Time flies when you’re having fun, whereas time slows to a grind when you’re suffering. The Copenhagen City Heart Study (CCHS) enrolled about 20,000 Dan­ish people 40 years ago and since then has been following them closely with questionnaires and check-ups. My close friend, cardiologist Peter Schnohr, M.D., is the CCHS study founder and director, and his special interest is exercise. So, the CCHS has focused most intently on physical activity, including the amount of time his fellow Danes have spent exercising in different types of sports through the decades. Peter and I, with the help of Jacob Marrot, a brilliant young Danish biostatistician, recently asked the question: do the different types of exercise we do in our leisure time have differing effects on life expectancy? With 25 years of unique data about this question, we came up with some startling findings. After Jacob adjusted the data for confounding variables, we discovered that compared to a sedentary (very inactive) lifestyle, all of the various forms of exercise added years of life, but there was a surprising amount of variability depending upon the types of activities they did rou­tinely. The people who played racquet sports such as tennis and badminton lived about six to 10 years longer than sedentary (inactive) people. The soccer players lived about five years longer; the cyclists, swimmers and runners lived about 3.5 years longer; and the people who went to gyms to work outlived only about 1.5 years longer. So it appears that tennis players, badminton players, golfers, dancers and soccer players tend to have ex­ceptional longevity. By far the smallest improvement in life expectancy was noted in people who predominantly did health club activities, such as working out on treadmill, elliptical, stair-climber, or stationary bikes, and weightlifting. The large differences in life expectancy gains in our study were not accounted for by the wide differences in duration and frequency of the various sports, as highlighted by the finding that the cohort of people who spent the most time exercising - health club activities group - was the one that showed the smallest im­provement in longevity. I will formally present these findings in a TEDx Talk in England in June 2018, so I have been contemplating the implications of this data for months. My best guess about what was driv­ing these striking findings is that the varying survival rates were due to the differing social aspects of the various sports studied. Notably, sports that re­quire two or more individuals to play together and socially interact—tennis, badminton, and soccer for example—are the sports that appear to improve longevity the best; whereas the more solitary forms of exercise, such as jog­ging, swimming, bike riding, and walk­ing on a treadmill or lifting weights, were associated with less impressive gains in life expectancy. This is in line with previous studies consistently showing that social isola­tion is one of the strongest predictors of reduced life expectancy. The World Happiness Report - an international survey of over 150 nations - ranks Denmark as the happiest country. The high degree of social connect­edness among the Danish population is one of the major factors contribut­ing to their remarkably high levels of happiness and well-being. The Danes are famous for their love of getting together with neighbors, friends and family to do group activities. Sports such as golf, badminton, dancing, yoga, two-person kayaking, snow skiing, doubles tennis, softball, and croquet do not typically require strenuous exertion, but do entail a great deal of social interaction. Regu­lar participation in highly interactive sports provides not only exercise, but also a social support group that plays together. Belonging to a group that meets regularly promotes a sense of support, trust and commonality, which has been shown to contribute to well-being and improved long-term health. My buddy, Dr. Mark Allen, grandson of the legendary KU basketball coach Phog Allen, is an avid golfer. Mark told me that when people whine to him about golf taking too long to play a round, he replies, “That’s the best thing about golf - it takes a long time, so you get to stroll around in a park-like setting, and have fun with friends. The best four hours of my Saturday are spent playing golf with my pals.” Golf, like racquet sports, also provides mod­erate intensity physical activity and is associated with improved well-being and longevity. Virtually all age groups can enjoy golf. Playing an 18-hole course entails walking about six miles; even when riding in a golf cart most people will walk about three miles. Observational studies report that regular golfers live an average of five to nine years longer than sedentary in­dividuals, which is in the range of the life expectancy gains noted among the other social sports in our study. Previously, Peter, Jacob and I analyzed the Copenhagen City Heart Study and found that jogging reduced risk of dying from any cause during follow up. Surprisingly, we found that the mortality was lowest among the joggers who ran at a slow pace, for not more 2.5 hours per week and not more than three runs per week. The runners who ran faster, longer and ev­ery day did not get as much of a boost in longevity. In other words, if you are exercising to improve your life expec­tancy, moderate exercise is ideal, and in fact, chronic excessive strenuous physical activity may negate some of the longevity benefits of less extreme doses of exercise. 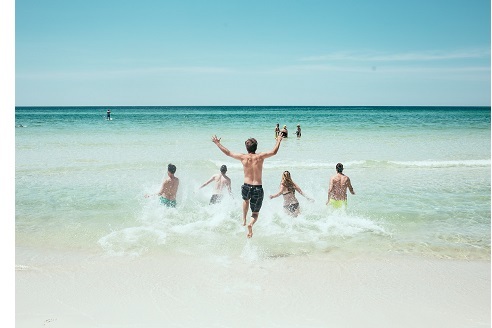 Although the sports such as tennis, badminton, golf, softball/baseball, basketball, handball, table tennis, pick­leball, volleyball and soccer by nature involve multiple people participating together, other more solitary forms of exercise, such as walking, jogging, cycling, swimming and health club activities, can be readily transformed into a social interaction by joining a group that exercises together on a regular basis. Exercising with at least one other friend or family member on a regular basis often improves the enjoyment and makes it easier to stick with a fitness regimen. If you want to keep your heart healthy and your brain youthful, you might also consider dancing. To be clear, virtually all types of physical activity including walking, jogging, riding a stationary bike, or using an elliptical trainer, or lifting weights are great for one’s brain, in part by increasing brain-derived neurotrophic factor (BDNF), which acts like Miracle Grow for the brain. Yet, new research shows that dancing confers especially impressive anti-aging brain benefits. A recent study published in Frontiers in Neuroscience using MRI brain scans found that dancing dramatically reduced age-related degeneration in brain structure among a group of people with an average age of 68 who met regularly to learn and practice choreographed routines.